I am loving all the pastel colours that are in the shops at the moment! In particular, the pastel/duck egg blues, blush pinks and lilacs. They are perfect for daytime and they look and feel so ladylike and chic. Following on from the pastel coloured runway looks displayed by Gucci at Paris Fashion Week earlier this year, the high street as always were quick to pick up on this trend. My all time high street favourite Zara, has got the look spot on as expected with lots of beautiful coats and accessories in pastel hues. I wasn't sure about this pastel blue on my skin tone when I first saw it. I knew that electric and royal blues look great on darker skin but I was a bit apprehensive of the pastel. 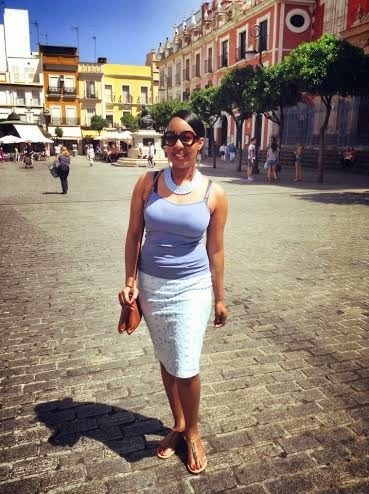 That changed as soon as I stumbled on this lace pencil skirt (above) from Tesco of all places! As soon as I tried it on I loved it! 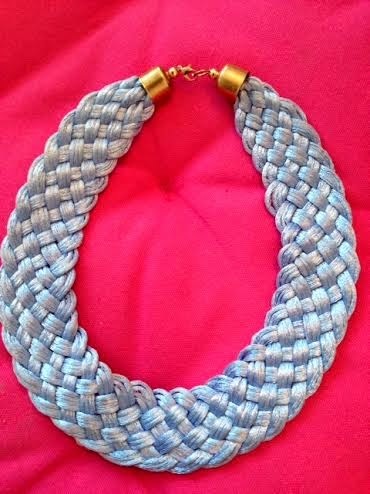 I then found this stunning duck egg blue necklace (below) in a small boutique whilst walking round Seville for 1 Euro - bargain!! If you are too a bit unsure of this trend, perhaps first try adding a scarf in a gorgeous soft pink or grey or perhaps just paint your nails in some of the lovely pastel shades that are available. Avon in particular have got a fabulous shade of lilac in their Gel Finish range called 'Lavender Sky' - its beautiful and a really subtle way to display the look. 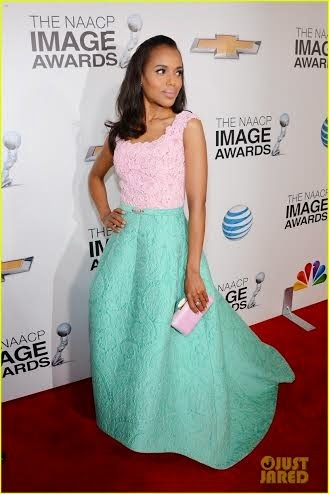 I love Kerry Washington in this look below who has done a colour clash of pastels perfectly in my opinion. It looks playful, soft and pretty. I'm stuck on this look, so no doubt I'll be posting new looks in different hues soon!